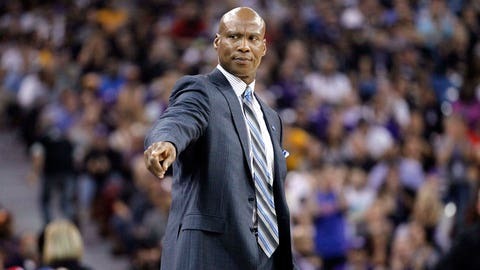 Lakers head coach Byron Scott feels his team has some growing up to do. The Los Angeles Lakers are in a weird situation this season. Even if you ignore the annual expectations of championship contention, the franchise is being pulled in two directions simultaneously. Fans are smart enough to know this squad isn’t going to win very many games in 2015-16. On the other hand, there are a number of young, talented players on this Lakers roster, which leads to hope that the team will be somewhat competitive and entertaining, at least. There have been moments when the Lakers have looked good in their first two games of the new season. But things are off to a rocky start overall in Los Angeles, particularly after Friday’s 132-114 drubbing to the Sacramento Kings. Kobe Bryant added that the problem was the Lakers’ fundamentals, citing the word multiple times in answers to reporters. "I hate to make it sound so simple, but it really is that," Bryant said, adding that Sacramento’s offensive rebounds also didn’t help. Asked if he had any answers for the defensive failings, Scott was at a loss. "I don’t. I wish I did. If I did, we would solve it."